Arsenal forward Alexis Sanchez will miss its first two English Premier League games of the season after picking up an abdominal strain in training, manager Arsene Wenger says. 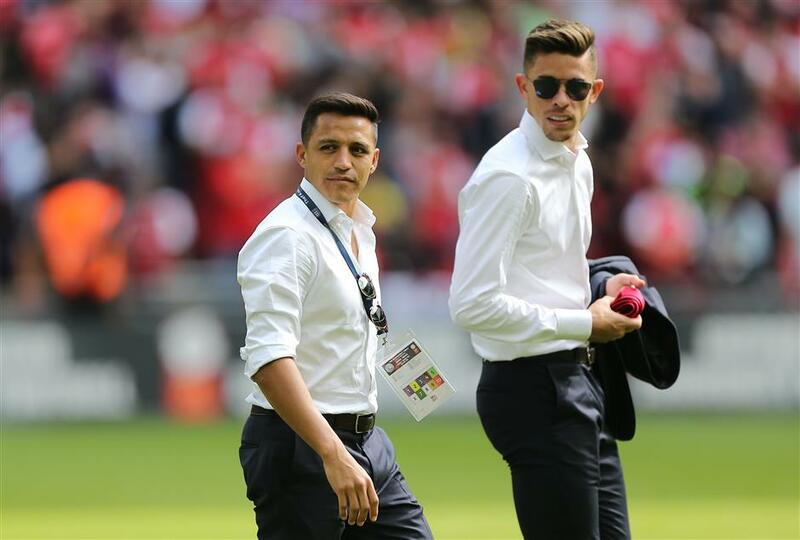 Arsenal players, Alexis Sanchez (left) and Gabriel Paulista walk on the pitch after their team's FA Community Shield match against Chelsea at Wembley Stadium in London on August 6, 2017. Alexis Sanchez will miss at least the first two games of the English Premier League season for Arsenal, with coach Arsene Wenger saying the absence is due to injury rather than doubts surrounding the forward's future at the club. Wenger said on Wednesday that Sanchez sustained an abdominal strain on Sunday — hours before Arsenal's win over Chelsea in the Community Shield at Wembley Stadium — and will be out for "two weeks or one more week". Arsenal plays Leicester City at home on Friday in the opening game of the league season. With Arsenal failing to qualify for this season's UEFA Champions League, Sanchez, who was Arsenal's top scorer in the league with 24 goals last season, has been heavily linked with a move away from The Emirates Stadium although Wenger has repeatedly said this offseason that the Chile international is not for sale. Manchester City and Paris Saint-Germain are reportedly interested in the player, who has just one year left on his contract at Arsenal. Wenger wouldn't say if any bids had come in for Sanchez. "I can't tell you that at the moment," he said. "I just think we are not open — what I said to you many times — to any offers, anyway. "(PSG) are looking for (Kylian) Mbappe, that’s what I read in the papers. I have had no contact with PSG." Sanchez's last game was the Confederations Cup final for Chile on July 2 and he was given an extended summer break. His initial return to training was delayed by three days, with Arsenal citing an illness, and now he is injured. Wenger said Sanchez would not have started against Leicester even if he wasn't injured. "We have all the other players prepared in preseason and they are all ready," said Wenger. The Frenchman also dismissed media reports linking Alex Oxlade-Chamberlain with rival Chelsea, according to Reuters. The 23-year-old England international has struggled to secure a regular place since arriving at Arsenal six years ago, but Wenger believes the winger has the potential to become a great player. "I think he had in his career some bad moments because he had some small injuries," the manager added. "Last year he was much more stable. Personally I think he is a hugely talented player, he's on the way up and he will continue to move up because the potential is there. "He's very conscious of his qualities, he was not always. I believe he will be a very great player." Wenger also confirmed goalkeeper David Ospina will stay at the club and fight for the No. 1 shirt with Petr Cech this season.